Claddagh earrings are studs that are crafted in sterling silver and feature an interlocking circle along with a green crystal heart. These sterling silver Claddagh earrings feature connected and interlaced circles that are enhanced with a green crystal in the hearts. The Claddagh stud earrings measures 5/8" wide x 3/8" tall; they are complete with push on butterfly backs. The Irish earrings are made in Dublin, Ireland by Solvar Jewelry and it is gift boxed with a Claddagh history card, complements of The Irish Gift House. 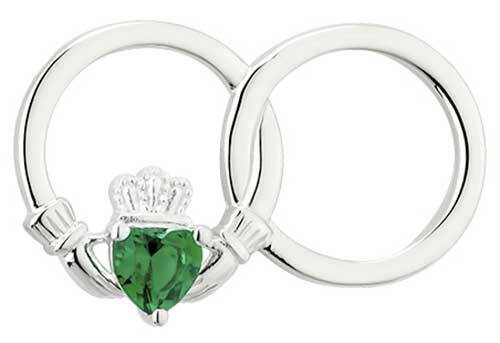 Claddagh necklace is crafted in sterling silver and features an interlocking circle along with a green crystal heart.